Achieve perfectly groomed and defined eyebrows with the High Definition Eye & Brow Palette in 'Bombshell', a comprehensive eyebrow and eye palette combining three long-lasting brow powders with a highlighter and setting wax. Specially formulated for fair hair and skin. The versatile compact allows you to fill in your brows, defining, enhancing and sculpting for a well-groomed, professional finish. The silky-smooth powders are easy to apply and blend, and are infused with antioxidant Vitamins E and C; they double as eyeshadows to create soft, smokey makeup looks. Use the highlighter to enhance your brow bone, and the wax for a defined or bolder finish. Housed in a mirrored compact with double ended applicator brush. Includes: 'Light Blonde',' Medium Blonde', 'Carbon', highlighter and wax. Suitable for fair hair and skin. 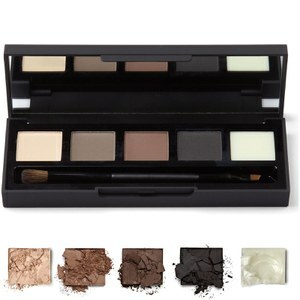 Simply sweep your chosen colored powder through the brow using the applicator to create a soft or natural look; you can also mix the shades to match your brows perfectly. For a more dramatic look, mix the wax with the brow powders to create a stronger look, or to draw on super fine hair strokes. 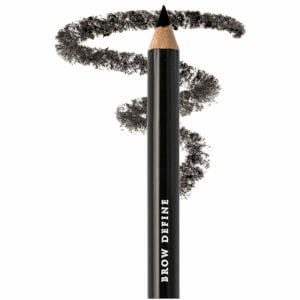 Use the carbon-black definer along the lash line for a defined eye liner, and the highlighter under the brows to enhance the brow bone. This versatile product can also be used as eyeshadow. Hydrogenated Coco-Glycerides, Talc, Mica, Polyethylene, Glyceryl Ricinoleate, Hydrogenated Palm Oil, Cera Microcristallina, Tocopherol [+/- Ci 77891, Ci 77499, Ci 77492, Ci 77491] Aqua, Alcohol Denat, Triethanolamine, Panthenol, Phenoxyethanol, Carbomer, PVP, Methylparaben, Propylparaben, EthylparabenPowder: Talc, Zinc Stearate, Lauroyl Lysine, Dimethicone, Paraffinum Liquidum, Octyldodecyl Stearoyl Stearate, Polybutene, Retinyl Palmitate, Caprylic/Capric Triglyceride, Argania Spinosa Kernel Oil, Tocopherol [+/- Mica, CI 77491, CI 77492, CI 77499, CI 77007]. Wax: Bis-Diglyceryl Polyacyladipate-2, Octyldodecanol, Polybutene, Cera Alba, Euphorbia Cerifera Cera, Copernicia Cerifera Cera, Hydrogenated Castor Oil, Polyethylene, Ethylhexyl Palmitate, Silica, Mica, Aluminum Starch Octenylsuccinate, Argania Spinosa Kernel Oil, Ricinus Communis Seed Oil, Tocopherol, Helianthus Annuus Seed Oil, Retinyl Palmitate, Caprylic/Capric Triglyceride, CI 77891.